You can find coffee in all flavors and sizes. Our beloved, intense brew is versatile. Just visit your local hipster coffee shop and see for yourself. 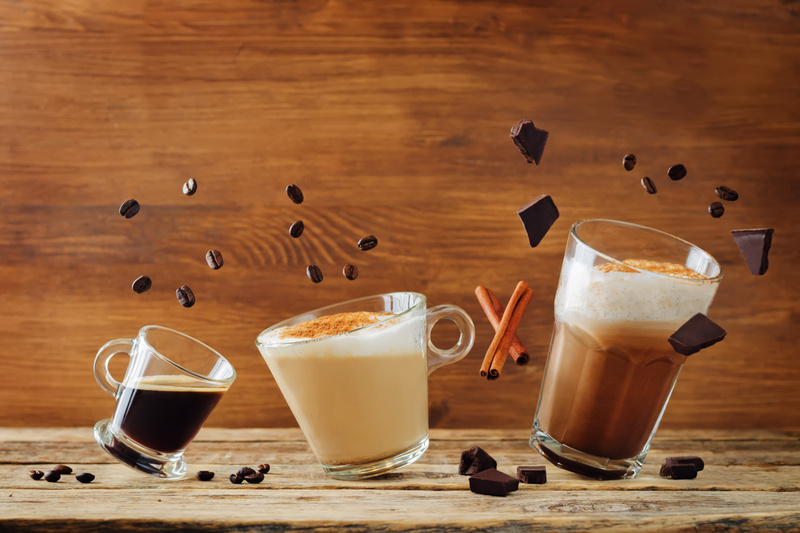 There are over 50 ways to serve coffee if we consider all the seasonal drinks and variations on the classics (pumpkin spice latte anyone?). Sure, information is out there, but we wanted to give it a go and make our own coffee guide. Below, you’ll find the most popular types of coffee and how they’re made. All to help you find your new spirit animal. Every modern coffee style boils down to its core element, a shot of espresso. Espresso is one of the most concentrated forms of coffee. Espresso machines force hot water through a tightly packed spoonful of ground coffee usually called a puck (132 pounds per square inch of pressure, to be precise). The result is a good, strong shot of coffee that can now become something else. Europeans drink lots of espresso, especially Italians. Americans, on the other hand, developed a taste for drip-brewed coffee, longer and subtler. By adding hot water to an espresso, you get a drink more to the taste of early day Americans; that’s the Americano. Controlling the volume of water that runs through your espresso machine creates different nuances in coffee. Use less water and you’ll get a ristretto, an aromatic style with lower caffeine levels. Double the amount of water and you come up with a lungo. Add a teaspoon of milk foam to your espresso shot, and you have a macchiato (or cortado). Even better add a splash of grappa instead (Italian brandy), and you get an espresso corretto; you can’t disagree, it has been, in a sense, corrected. After coffee, milk is the most important element in many of your favourite caffeinated drinks. It all starts by adding some milk to your shot to create a Café au lait. According to Starbucks CEO Howard Schultz, the best-seller at his chain is Latte; a shot of espresso, milk and milk foam make a beautiful example. Depending on the amount of milk added, you might just call it a Cappuccino; or leave out the milk, and you made yourself a Flat White; substitute the foam for whipped cream and now it’s a Vienna. Isn’t that fun? Of course, proportions matter, and you need expert barista training to master all the distinct styles. Then we have the other coffee styles like the chocolate-flavoured Mocha or your Pumpkin Spice Latte. And let’s not forget there’s a frozen version for almost every style. This might come out as a cliche, but getting coffee comes down to your preference. Long, sweet, creamy drinks, or short, on-point hits of caffeine, it’s up to you. Don’t be afraid to ask questions and make sure you step out of your comfort zone once in a while. Coffee is good to all. So, there you have it, a few styles of coffee explained and the way they transform with the slightest touch of your friendly barista. May the lines be short and your coffee strong.